Is administrative law unlawful? This provocative question has become all the more significant with the expansion of the modern administrative state. While the federal government traditionally could constrain liberty only through acts of Congress and the courts, the executive branch has increasingly come to control Americans through its own administrative rules and adjudication, thus raising disturbing questions about the effect of this sort of state power on American government and society. 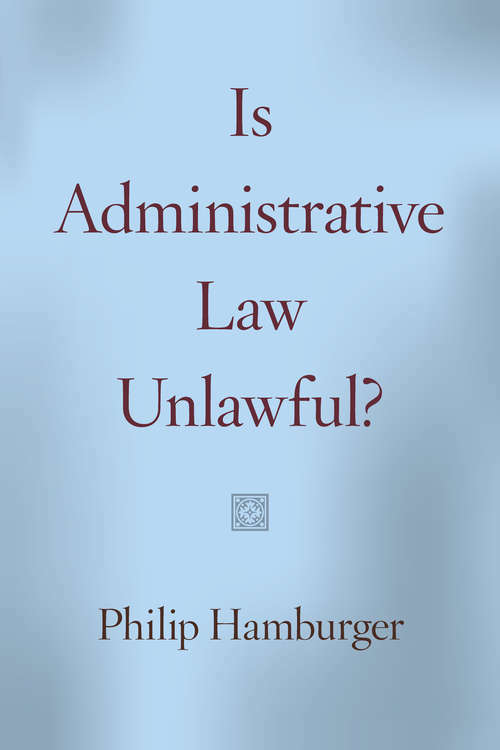 With Is Administrative Law Unlawful?, Philip Hamburger answers this question in the affirmative, offering a revisionist account of administrative law. Rather than accepting it as a novel power necessitated by modern society, he locates its origins in the medieval and early modern English tradition of royal prerogative. Then he traces resistance to administrative law from the Middle Ages to the present. Medieval parliaments periodically tried to confine the Crown to governing through regular law, but the most effective response was the seventeenth-century development of English constitutional law, which concluded that the government could rule only through the law of the land and the courts, not through administrative edicts. Although the US Constitution pursued this conclusion even more vigorously, administrative power reemerged in the Progressive and New Deal Eras. Since then, Hamburger argues, administrative law has returned American government and society to precisely the sort of consolidated or absolute power that the US Constitution—and constitutions in general—were designed to prevent. With a clear yet many-layered argument that draws on history, law, and legal thought, Is Administrative Law Unlawful? reveals administrative law to be not a benign, natural outgrowth of contemporary government but a pernicious—and profoundly unlawful—return to dangerous pre-constitutional absolutism.